For the past two months, I have been traveling back and forth to Romania and England. I have been able to meet with several pastors and church leaders, and we are in the planning stage of organizing teams to go over and help with two church planting projects within the next year. It is always exciting to see what God is doing around the world, but has become even more interesting, since we will be doing these things during an unexpected ministry change. Berca is a village just outside of Buzau. Many years ago, a missionary had bought a building in Berca and started a work, but through the years it had died out. 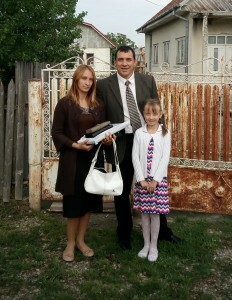 Pastor Mihai and his family, pictured to the right, moved to this village last year. With some help from the Ocean State Baptist Church in Smithfield, RI, it is our desire to relaunch that church this Spring. We have already planned the trip, and will be helping Pastor Mihai to renovate the church building and hold their first service. Because of the struggling economy in Romania, it is also our desire to help Mihai remain a pastor for the long term. We have been praying that God would lead someone to lend him $5,000 to purchase bee hives. With these bee hives, other pastors in Romania have been able to do the work of the ministry, and make almost a years wages by selling honey. Pastor Mihai has given me his word to have that money paid back in five years time. In 1995, God allowed me to lead Ionel Stoica to the Lord. He was baptized, went to Bible Institute, and served in the church in Constanta for many years. Three years ago, he went to New Castle, England seeking a better economic situation for his family. About a year ago, he called me and told me that he was starting a church. They are currently renting a building from the Anglican church, and on weekdays have home prayer meetings and Bible study. I had the great privilege of visiting them two weeks ago and preaching for his new church. 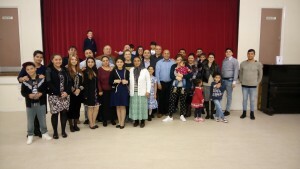 It is amazing to see how God is using this Gypsy family. Please remember to pray for them as they continue to reach people in England. As I mentioned at the beginning of my letter, we are in the middle of a ministry change. In August, while I was getting ready to return to Romania to prepare for my family’s arrival in September, the Lord opened an unexpected door. After much prayer and seeing the Lord’s hand guide us, I have accepted the pastorate at the Faith Baptist Church in Enfield, CT. For those of you who are not familiar with Faith Baptist Church, it is a VERY mission minded church, and I consider it a privilege to be their pastor. I am looking forward to working with this group of humble, sacrificial, and God-honoring people, not only to grow the church, but to do even more for missions! While our family may not be able to return to full-time service on the field, we assure you, our involvement and commitment to foreign missions will not waver. We cannot thank all of our supporting churches and pastors enough for your trust, and for supporting us for the last 23 years. I am overwhelmed with your love, generosity and support for the ministry in Romania. We will begin our service at Faith Baptist Church officially, as of the 1st of January 2016, so we will still be in need of and receive support through the missions office through December.